At $199, Amazon may be selling its new Kindle Fire at a loss, emulating King Gillette's marketing brainstorm: sell razors dirt cheap and make money on the blades. According to a "preliminary virtual estimate" by the research group IHS, the Fire's bill of materials cost is $191.65, barely squeaking in below the $199 list price, and giving the new seven-inch fondleslab a less-than-massive profit margin of around 4 per cent. 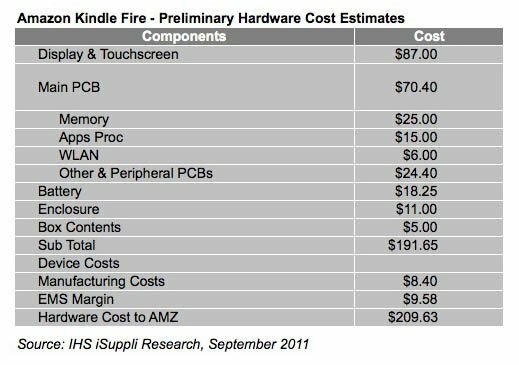 Add manufacturing costs to the mix, however, and IHS calculates that the Fire costs $209.63. As the old joke goes, "Yeah, we may be losing money on each sale, but we'll make it up in volume." But if IHS's preliminary analysis is correct, Amazon is more canny than that old thigh-slapper might suggest. IHS believes that Amazon is willing to make only a marginal profit on the Fire plus a relatively small amount of digital content that users will buy per tablet, because the online retailer is using it as a loss-leader to get customers into its online store where they'll pay good, high-margin money for gadgets, gizmos, and gewgaws. A reasonable argument, but Amazon may have more than mere enticement in mind. Digital content – warning: prepare for a "well, duh!" statement – is the wave of the future. And although digital content may not have high margins, shipping electrons over the interwebs has fewer back-end costs than does shipping those aforementioned atom-suffused gadgets, which require inventory management, warehousing, boxing, and other brick-and-mortar nuisances. Amazon wants it both ways: use the Fire as a loss-leader as IHS suggests, and use it as a free razor-handle into which you can insert an endless stream – pun intended – of disposible-blade digital content. And, it should also be noted, use it to drive the public's perception of what a tablet should cost down into that magic sub-$200 range. Cupertino may continue to charge a premium for its iPad hardware – ever hear that said of Apple before? – but other fondleslab punters are now in a whole new world: one that starts at $199. And without Amazon's vast digital and real-world retail offerings surrounding competing tablets, it will be hard for them to continue that competition – as if they're doing all that well at present.